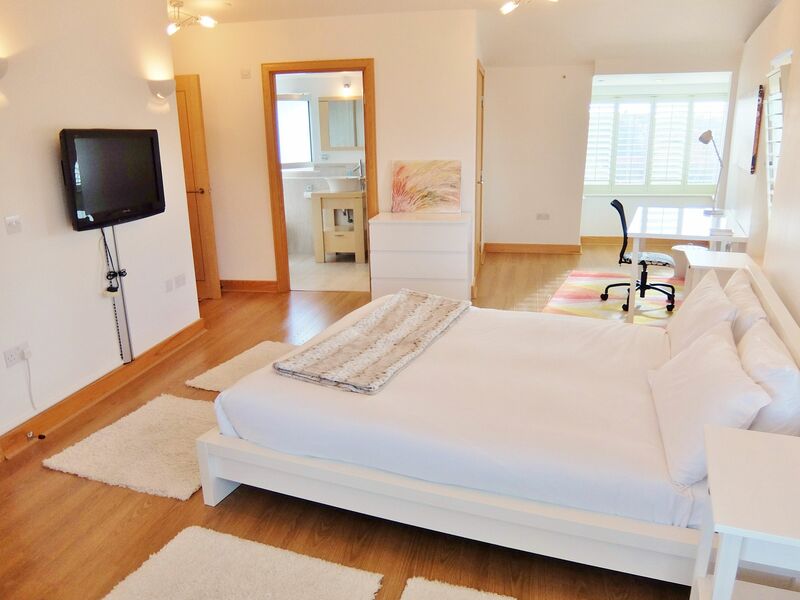 Our beautiful 3 bedroom penthouse apartment in Hampton Court Village covers the entire 3rd floor of the building. It’s 121 square metres, and features lovely views of the Thames and Hampton Court Palace. 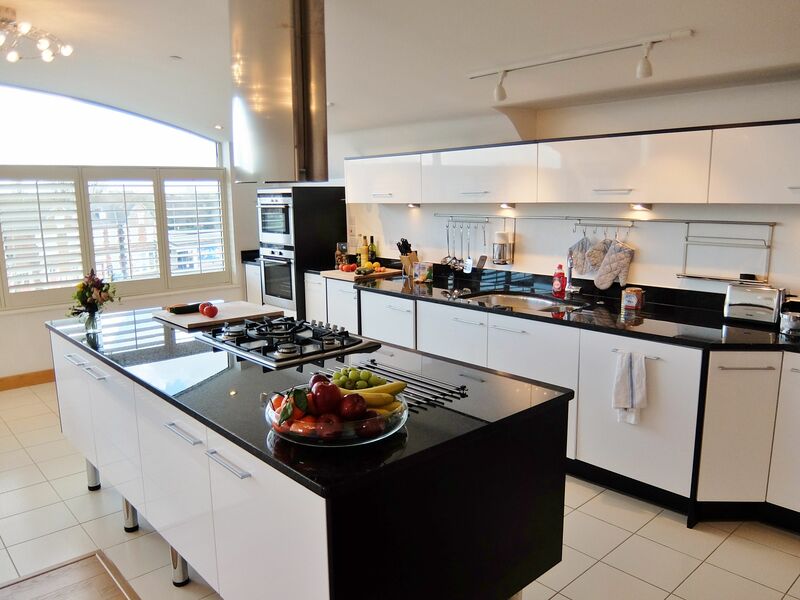 The spacious (41 sqm), open-plan living and kitchen area is stunning and features a large dining table for 6-8 people, two sofas, and luxurious kitchen fittings. All three bedrooms have a TV, and the master bedroom (32 sqm) has an ensuite bathroom. This apartment really needs to be seen, rather than described! 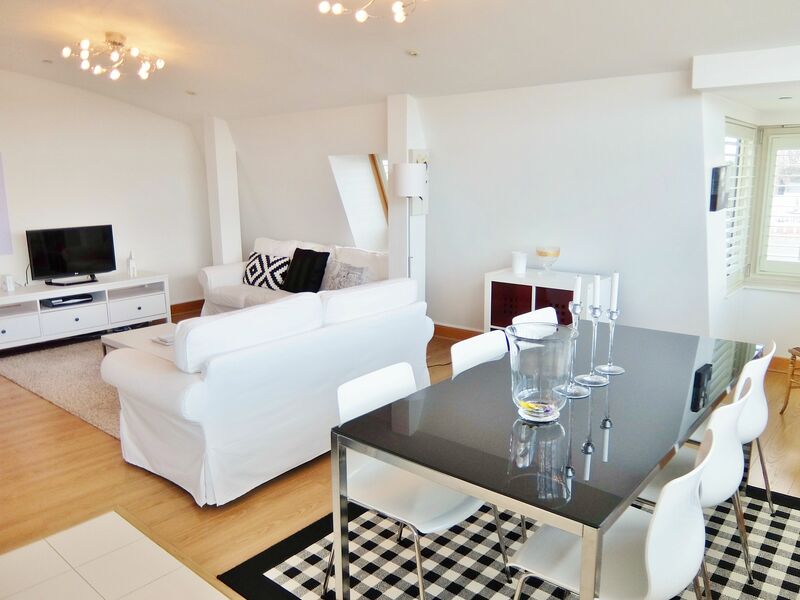 Located between the hub of Bridge Road, Hampton Court Bridge and the riverside, the apartment’s tranquil and private. It’s a beautiful location and Bridge Road itself has an eclectic village feel with its classy mix of independent cafes, restaurants, pubs, galleries and antique dealers. It’s just a 2 minute walk from Hampton Court station which is opposite, and a 4 minute walk from the majestic Hampton Court Palace. There’s Wifi, Smart TV, parking, a washer/dryer, step-free lift access and zip and link beds. The apartment features an open-plan kitchen/living area, a fully fitted kitchen, and 17 mbps Wifi. The kitchen has a washer/dryer, a full fridge freezer, a dishwasher and a large dining table with six chairs. The living area has a 32 inch Smart TV, two sofas and a coffee table. 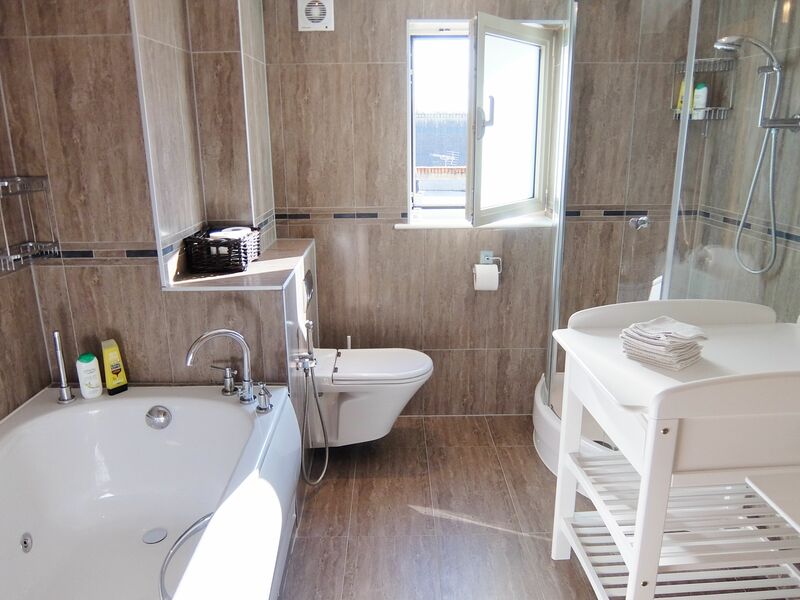 The main bathroom has a separate shower cubicle and a bath, and the ensuite bathroom has a shower cubicle. The master bedroom has a king double bed with twin bedside tables and reading lamps. The second bedroom has a double bed. The beds in the third bedroom can be split into two singles (zip & link). 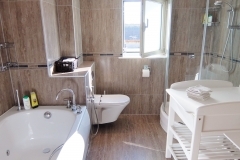 The apartment has wooden flooring throughout and tiles in the bathrooms and kitchen area. The apartment building is positioned between Bridge Road and Creek Road. The village feel of Hampton Court, aka East Molesey is really Bridge Road, along with Hampton Court Station across the road. Kingston upon Thames is 2 miles to the east, Walton-on-Thames and Sunbury are 4 miles to the west, Teddington is 2 miles to the north and Thames Ditton is a mile to the south. It’s a stunning location, a 1 minute walk from Hampton Court Bridge and the picturesque Thames riverside, and a 4 minute walk from the world famous Hampton Court Palace, where Henry VIII lived in the 16th century. It’s a 10 minute drive (3.7 miles) to the M3 and Sunbury-on-Thames, and a 15 minute drive (4.5 miles) to the A3 via Esher. This 3 storey building opened in 2012. The ground floor is an Italian restaurant called The Square Olive. There’s a small communal entrance area with post boxes. There’s a video entry system. On-site secure underground parking is included (one space) and can only be accessed with a code and via Creek Road. There’s lift access to the third floor (where the penthouse is the only apartment) from both the car-park and the main entrance. © London Executive Apartments 2019.